Miss Berry sends Mrs. Cheeves some booklets on the Berry Schools for her paper for the Woman's Club meeting. Bartholomew is being sent booklets giving the story of the schools and a photograph she can use in her magazine. 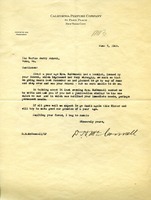 The letter includes a list of people for Bartholomew to invite to the upcoming dinner. 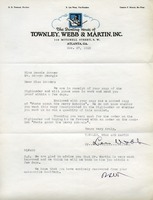 Letter to R. W. Allen from Martha Berry informing him that they did not have more of the booklet "Martha Berry's Labor of Love" which he requested. 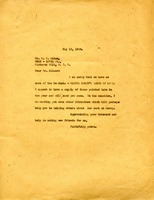 However, she did send him other literature that would help him in informing others about the work done at the schools. 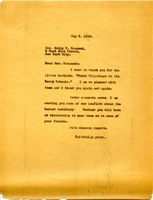 Mr. Stringham writes to acknowledge the receipt of the booklet that was recently published. 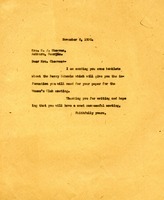 William D. Southwick asks Martha Berry to send a booklet about Berry and her work to Miss J.M. Hammond who lives with Mrs. Sarah G. Hammond and Mrs. H.H. Crane. These three former school teachers own the Colonial Cafeteria and have recently opened a new cafe and confections shop. Southwick mentions that they are "well to do" and interested in Martha Berry and her work. 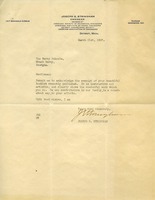 D.H. McConnell writes on California Perfume Company letterhead to request information about the Berry School. His wife previously had a booklet and they were so impressed they wished to visit during their winter trip to the South. Martha Berry thanks Mrs. Hammond for the "Third Pilgrimage to the Berry Schools" booklets. 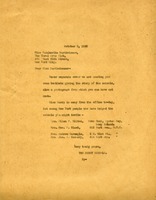 Martha Berry writes that she will send leaflets on damaged dormitory soon.